The Dimes Project provides several excellent data sets that describe the structure of the Internet. 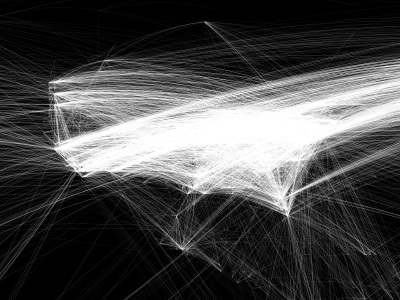 Using their most recent city edges data (Feb 2007), Chris Harrison created a set of visualizations that display how cities across the globe are interconnected (by router configuration and not physical backbone). 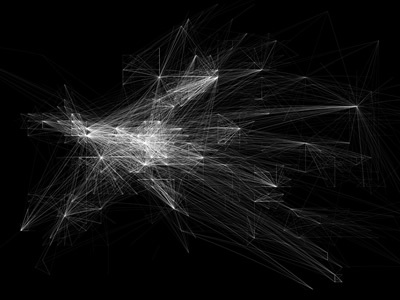 In total, there are 89,344 connections. The renderings shown here represent network connections among the globe, focusing on Europe (first image) and North America (second image). The intensity of edge contrast reflects the number of connections between the two points. No country borders or geographic features are shown. However, it should be fairly easy to orient yourself. The second image is also part of a full rendering of the world shown on the site. Note: No projection has been applied to the geographical data. Latitudes and Longitudes were rounded to the nearest whole number and used in a flat coordinate system. This means that the planetary surface area represented by each point varies, skewing how the data (and densities - both point and edge) is shown.